The Tusk Motorcycle Enduro Lighting Kit is designed to be a simple way to provide front and rear turn signals, tail/brake lights, horn, and rearview mirror for your motorcycle. The Tusk Motorcycle Enduro Lighting Kit is easy to install and does not require cutting into or messing with your motorcycle's existing wiring. The components have universal applications and will work on almost any motorcycle with minor modifications. The kit is intended for motorcycles with existing headlights. This is the perfect kit to make your motorcycle street legal. Other parts may be required in your state. The Tusk Motorcycle Enduro Lighting Kit is an easy to install lighting kit that doesn't require you to cut into or interfere with your motorcycle's wiring. 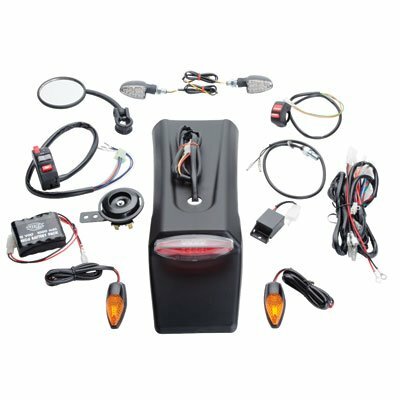 Kit comes complete with wiring harness, LED mini-stalk front turn signals, LED flush mount rear turn signals, flasher relay, horn, hydraulic brake switch, LED taillight/brake light, dual sport folding mirror, On/Off switch, and control switch. The kit is intended for motorcycles with existing headlights. If you have any questions about this product by Tusk, contact us by completing and submitting the form below. If you are looking for a specif part number, please include it with your message.